As a serious beer blogger, I have to give you the news, however unpleasant they might be to some of you. I just received the sad new that the scientists have found out who are really threatening – not only civilization and our way of life – the planet. Our planet, presumably. It’s the Canadian beer drinkers. Sorry Alan, you have a lot to answer for. Hackney is a part of London that’s new to me. As I will be going there for the Pig’s Ear Beer Festival next week, I thought I’d check if there were any interesting pubs close to the venue of the festival. Fancyapint? 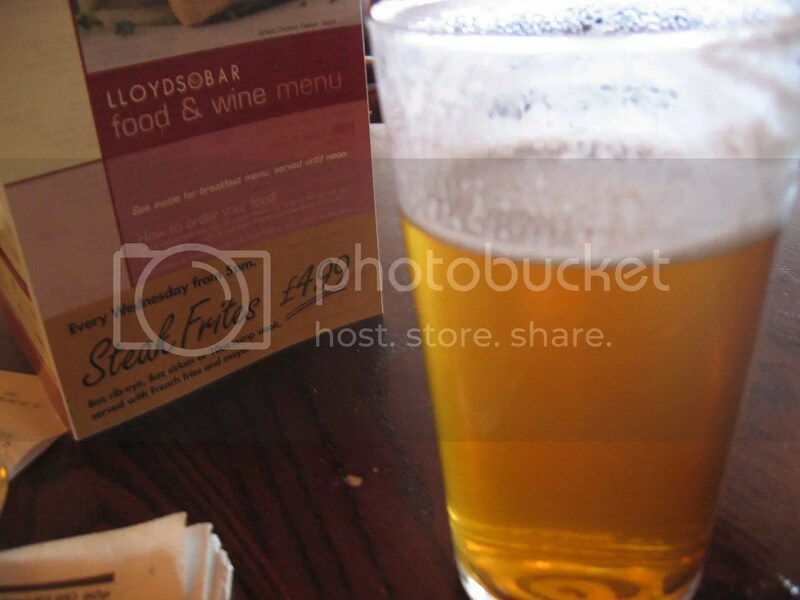 is a really useful tool to find London pubs, even if they tend to be too vague about the beers on offer in their reviews. We can’t even remember what used to be there, but it now has a bright, Modern interior that unfortunately contrasts with the somewhat dingier clientele. Wetherspoon’s fine beer keeping standards are evident here – the de Koninck was excellent, but we suspect most of the clientele are buying on price. The bar staff were politely struggling to persuade some of the clientele to refrain from singing and shouting, early on a Monday evening. But don’t think the lager louts here are in the 18-30 age group. Far from it, they’ll not be paying for the night bus home, not with a pensioner’s bus pass. A fine illustrated article in the Wall Street Journal today about the Westvleteren beer from the St Sixtus monastery in Belgium. For beer geeks like me, there is nothing new here, but for everyone else, it is an example of how endlessly fascinating the world of beer is. Yet another beer story in mainstream media, it is catching on. The London Transport Museum has recently opened after being closed for refurbishment for some time. The reviews, as far as I have seen them, have been good, maybe I’ll find time to pop in next week. But in this day and age the virtual museum can be just as important. One outstanding feature of London Transport/TfL has been the use of various art forms in the ads for their services. Many vintage posters have been available for sale as reproductions and postcards, now much of this collection is available to watch online. There are lots of stylish between-the-wars restaurant scenes, but not much dedicated to beer drinking and pubs. (You might remember they axed an ad for the GBBF last year!). I managed to find a few posters with a beer reference. This one is not made to promote beer or pub culture, but for the Royal Academy. But at least it has a nice pub scene! Supermarkets and off-licences are to be banned from selling alcohol 24-hours a day, reports the Sunday Mirror, which is again quoted in the Morning Advertiser. The paper says that the review of the Licensing Act will continue to allow 24-hour opening for pubs, clubs and restaurants. The Mirror claims that senior Number 10 sources have revealed that it will impose new restrictions on the off-trade. Apparently, Culture Secretary James Purnell will tell councils to only allow supermarkets to sell alcohol after 11pm if they have “an extremely good case”. 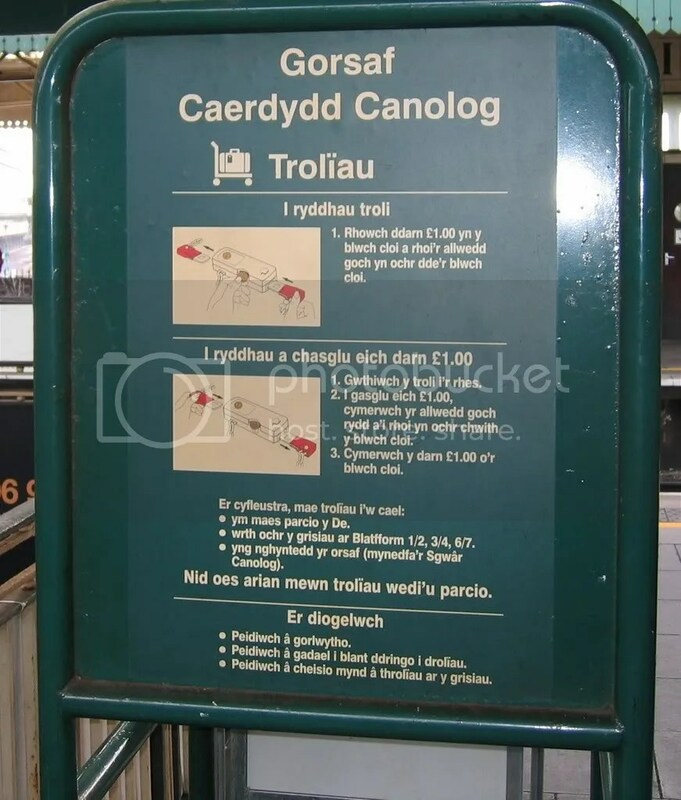 It is believed exceptions would be made for supermarkets in tourist spots, railway stations and airports. Well, if you ask me, I would say that if you want to control exessive drinking, agressive behaviour and other similar aspects of Western civilization, making exceptions for outlets in railway stations would be the last thing to do…. maeib has set up a list on his blog of how he would stock a beer fridge with 15 beers of 15 different styles from 15 countries. This is a tricky one, not the least because I feel that the ratebeer categories will be a bit hair-splitting to some. And I would have a Trappist category. I don’t know how such a list from me would end up. Should the Imperial Stout come from Ireland (Porterhouse Celebration), Denmark (Mikkeller), Scotland (BrewDog) or Norway (Nøgne ø)? I’ll get back to you about this. Something to discuss over a pint at the Pig’s Ear festival next week, perhaps? OK, then, one more Brussels spot, this one a return visit. It was the end of a long day of meetings, finishing up with a stand up networking dinner. Good food and pleasant company, but I needed some time of my own before going to bed. The Metro a few stops to the Central station, a short walk up hill instead down towards the Grand Place, and here I was at the Bier Circus. It is a quiet weekday evening. Last time I was here the bar was more crowded, today it is easy to find a stool. Some regulars pop in, have a glass of the blond on tap and then continue into the night. The rain has stopped during the day, the temperature is quite blamy ( at least for a Norwegian). But the calendar says Christmas is right around the corner. So it is time for trying a few seasonal beers – there are more of a dozen of them in the beer list that otherwise runs into the hundreds. There is one Christmas beer on tap, the lovely Tournay de Noëlfrom the Cazeau brewery. Lovely sweet and spicy, enough of a body to cope with both candy sugar and spiciness. Dark, warming beer. I have room for one more, but some of the bottled Christmas beers are 0,75 l bottles of beer approaching 10%, which would simply be too much of a good thing at this stage. 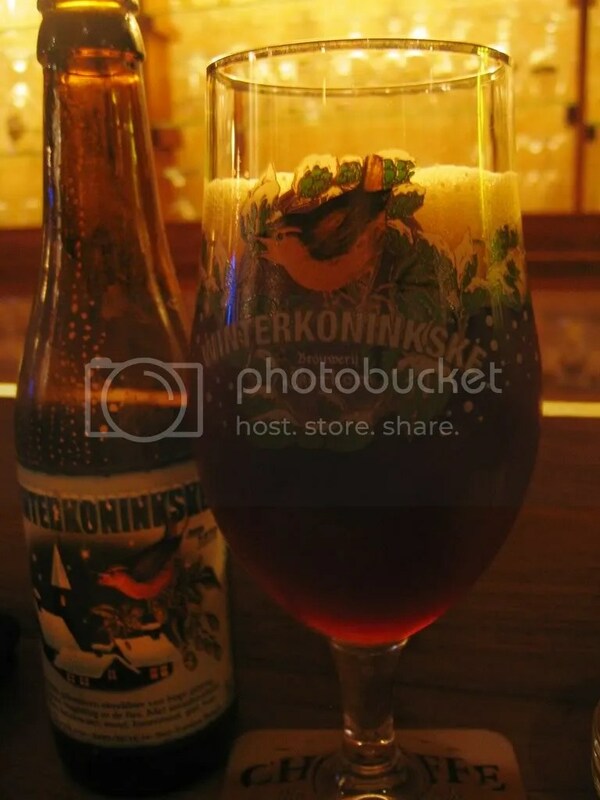 I go for a Winter King or Winterkonikske from the Kerkom brewery (Motto: We brew it here. We drink it here. We sell what’s left). This is a real winter warmer! Malt, sugar, spices, yeast giving a little sourness, warming alcohol. It is not dissimilar from the first one. Attentive service without being intruding, no music that would offend anyone. 5 beers on tap, some of them rotating, a long beer list, a sensible prized menu including daily specials. Give me a local like this! 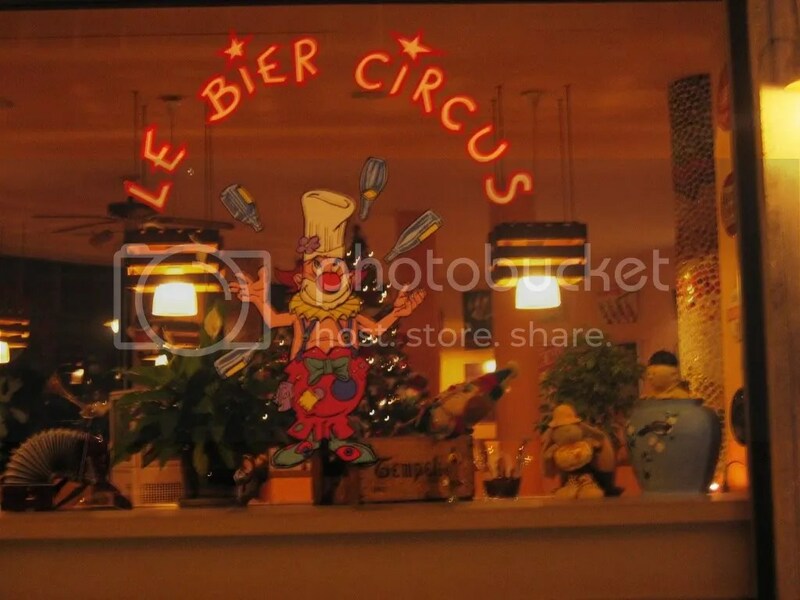 I pay the bill, compliment the bar man on their selection and stroll content out into the Brussels night.